The Nike Hoop Summit World team was officially announced today, complementing the USA roster which was announced in January. The game is scheduled for Friday, April 7th at the Moda Center, in Portland, Oregon at 7:00 PM PST (10:00 PM EST), a contrast to previous years when it was held on Saturday afternoon. Nike and USA Basketball will once again bring some of the top under-20 players in the world together in Portland, Oregon for a week of practice in preparation for the 20th Nike Hoop Summit, an event that ranks among the most widely attended by key NBA decision-makers on the scouting calendar. After suffering a painful blowout loss a year ago, with one of the weakest rosters in recent memory, the World Select team has regrouped with a distinct North American high school feel, and a backcourt flush with Canadians. 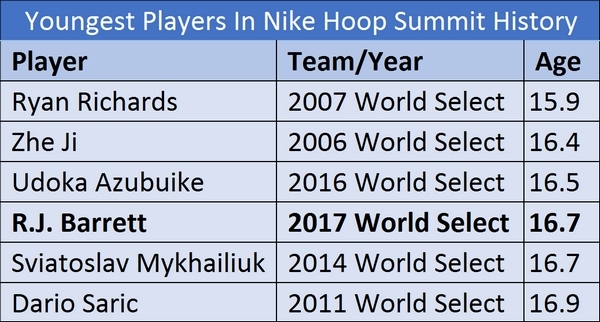 Nike elected to eschew inviting top talents with adidas contracts, such as Rodions Kurucs, or a single French player (Jonathan Jeanne wanted to play but was rejected), as they clearly preferred to bring players familiar with competing against American high schoolers through the AAU system, which may give them a better chance of withstanding the inevitable full-court press that demoralized the World Team last year. DeAndre Ayton, after passing on the Basketball Without Borders Global Camp last month, declined his invite this time, as he struggled mightily at this event last year. As has increasingly been the case in recent years, more than half of the World Select team is either based in US high schools or are on the NCAA track. They are mixed in with a few highly regarded European-based talents who could factor into the 2017 NBA Draft and beyond. Isaiah Hartenstein is perhaps the headliner in the latter group, already seeing regular playing time with Zalgiris first team in the Lithuanian first division. A skilled, versatile power forward with a terrific frame coming off a solid showing at the FIBA U18 European Championship where he averaged 14.7 points, 9.5 rebounds, and 3.5 assists over just 25.7 minutes per game, Hartenstein is a potential top-20 pick who will have every opportunity to solidify his standing in the eyes of scouts in Portland. He has plenty to gain from a strong showing, especially if he can show a steadier on-court demeanor and any progress hes made physically and as a shooter and defender competing against professionals full-time. With the amount of centers on the roster, the 7-foot Hartenstein will likely have to play quite a bit of power forward, which will make for some interesting matchups in practice and the actual game. Though Hartenstein may be the headliner in the short term, NBA scouts will perhaps be keeping the closest eye on R.J. Barrett, who looked every bit the part of a top NBA Draft pick at the Basketball Without Borders Global Camp held at All-Star Weekend in New Orleans. Currently slated to graduate from Montverde Academy in 2019 (although he may reclassify), Barrett is one of the youngest players ever invited to the Nike Hoop Summit. This figures to be a fascinating test for the tremendously gifted young wing who could conceivably play in a record three Hoop Summits before he heads off to college. It will be interesting to see where Barrett falls on the spectrum of performances by Canadian underclassman at the Hoop Summit under Roy Rana, as both Jamal Murray and Andrew Wiggins left strong impressions the first years they attended. Barrett is one of four Canadian players on this years roster, joining three highly regarded class of 2017 guards. They figure to play a key role in this teams success after last years World Select Team crumbled without a capable floor general against the relentless pressure from the USA Basketball Junior National Select Team. The trio of Shai Alexander (Kentucky), Lindell Wigginton (Iowa State), and Nickeil Alexander-Walker (Virginia Tech) all showed well for Canada at the 2016 FIBA U18 Americas Championship and each bring something a little bit different to the table on top of their familiarity with Rana who coached them in that event. Alexander-Walker, in particular, is a player to keep an eye on, as h went for a game-high 25 points in Canadas competitive gold medal game loss to a United States team that featured the likes of Markelle Fultz, Michael Porter and Jarrett Allen. Another European player who can help his stock in Portland is German wing Kostja Mushidi. The Mega Leks product had somewhat of an up and down showing at the U18 European Championship in December, struggling to shoot the ball consistently, and having a difficult time navigating the extreme lack of spacing the German team suffered with his shaky ball-handling in the half-court. Hes getting good experience for an 18-year old this season playing in the Adriatic League (and FIBA Champions League), even if his efficiency thus far (49% 2P%, 31% 3P%) leaves something to be desired. Mushidi will give the World Select Team a physical wing defender with long arms, a very strong frame and the ability to make a spot-up jump-shot, which theyll need to slow down the many highly explosive guards and wings that make up the US roster. The World Team decided to double down on size this year, inviting two more traditional centers in five star, strong-framed, 611 and Jamaican-born Nick Richards, headed to Kentucky, and Ikey Obiagu, a long-armed, top-50 recruit and 7-footer headed to Florida State. It will be interesting to see how this huge collection of big men assembled by the World Select Team is able to match up with a very dynamic US team brimming with athleticism, skill and positional versatility. Besides the long-armed defensive presence of Mohamed Bamba, the Americans feature a number of tall players who can step out to the 3-point line and stretch the floor, while also having two super athletic guards in Collin Sexton and Trevon Duval that love to push the ball in the open court. The World Team will need to find a matchup for Michael Porter in particular, a 610 athletic combo forward with a very high skill-level. The Nike Hoop Summit is an event every prospect wants to play at, as it's arguably the most closely watched setting of practices, scrimmages and official game outside of the NBA Combine for General Managers and high level executives. It can boost a players stock into the stratosphere with a strong showing, like we saw with Enes Kanter, Bismack Biyombo, Saer Sene, Livio Jean-Charles, Dennis Schroeder and Dante Exum. It can also really put a damper on prospects NBA draft momentum, as players like Clint Capela, Evan Fournier, Nikola Jokic and others found out. The organizers havent attempted to cater to the NBA scouting community as much as of late with the prospects theyve elected to invite, preferring to try and put a roster that they feel gives them a better chance of winning the games, so it will be very interesting to see how things play out after last year's dismal showing by the World Team.